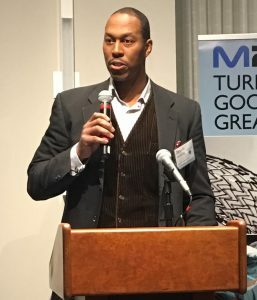 Last night was a big night for seven life sciences innovators, as their devices were chosen as winners of the 7th annual M2D2 $200K Challenge at Mintz Levin’s Boston headquarters. Now, here are your $200K Challenge winners! Seventh Place: NERV Technology, whose implantable biochip platform detects post-operative anastomotic leakage. Sixth Place: DTFx, with a universal neurostimulation dosing platform. Fifth Place: MAG Optics, who have developed an intra-corneal implant for treatment of keratoconus. Fourth Place: Bitome, whose device enables non-invasive monitoring of human hydration. Third Place: 149 Medical, with a non-invasive, real-time brain hemodynamics and metabolism monitor. Second Place: Versatope, who have developed a versatile vaccine delivery platform derived from recombinant outer membrane vesicles (rOMV). And the First Prize winner: Leuko Labs, developers of the first white blood cell analyzer that does not require a blood sample. Congratulations to all the Challenge Winners! We look forward to seeing your progress in the months to come. Challenge sponsor Mintz Levin for hosting the evening. Our other corporate challenge sponsors: Johnson & Johnson Innovation, the Massachusetts Life Sciences Center, Amgen, Boston Scientific, Mintz Levin, MPR Product Development, and R&Q (Regulatory & Quality Solutions). Travis McCready, for his words of encouragement and inspiration. And most of all, the visionary startups—numbering more than 100, a challenge record—that entered their ideas in the Challenge. We wish all of you success.